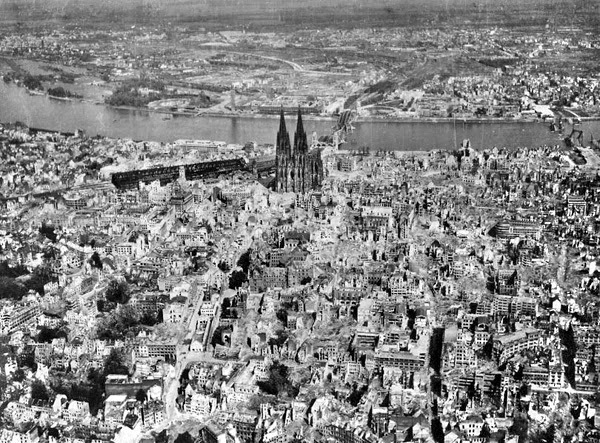 Call it Köln or Cologne, it's where we went last weekend. 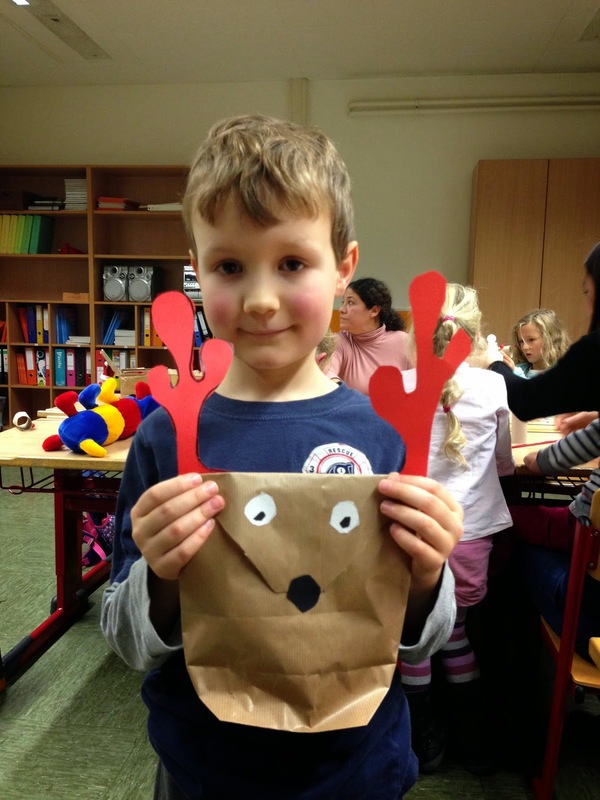 Daphne's teacher has encouraged his students to ask their parents to take them to Deutschland when they go on holiday so they can practice their German. Well, we Ts are nothing but a bunch of people-pleasing teacher's pets, so off to Germany we went on our weekend off from church music! Daphne was our trusty interpreter. 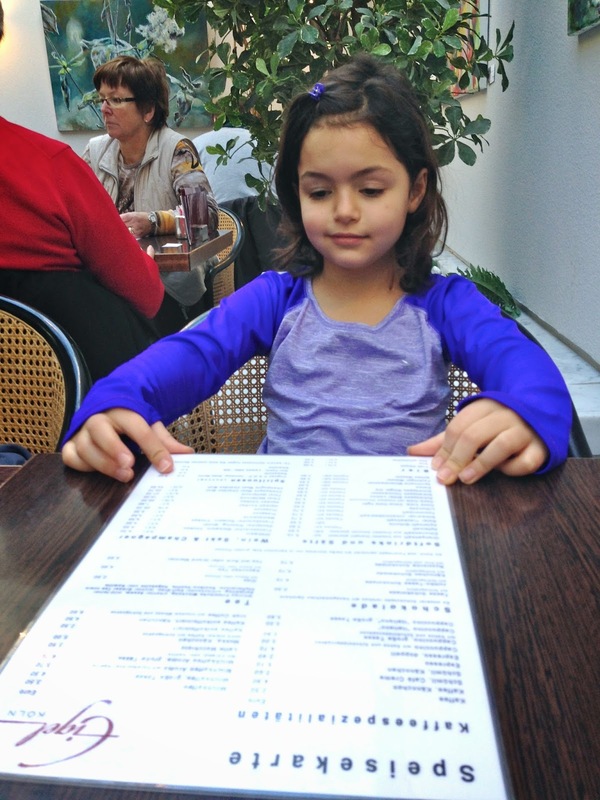 She did a wonderful job ordering all our food, asking loads of questions for us, and even scheduling a museum tour over the phone. 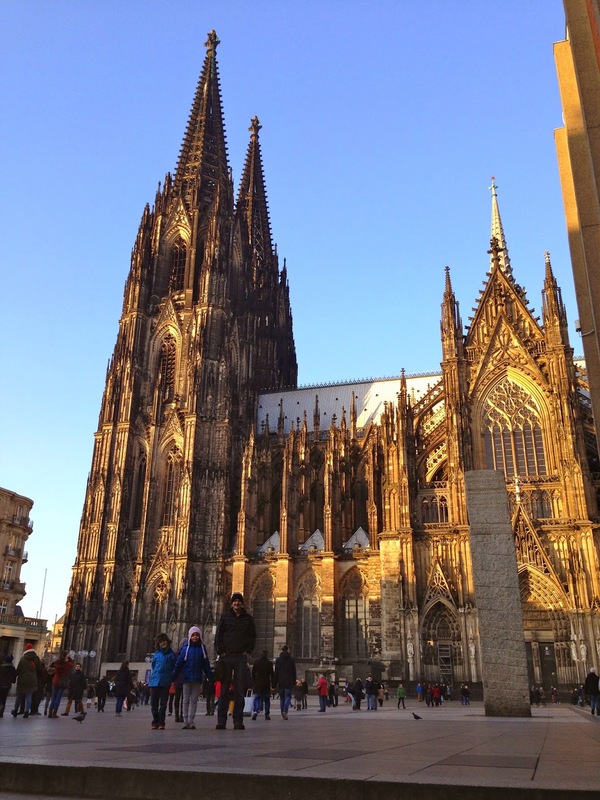 The main attraction in Cologne has to be its impressive gothic cathedral. It was very crowded and quite loud inside, but gorgeous nonetheless. 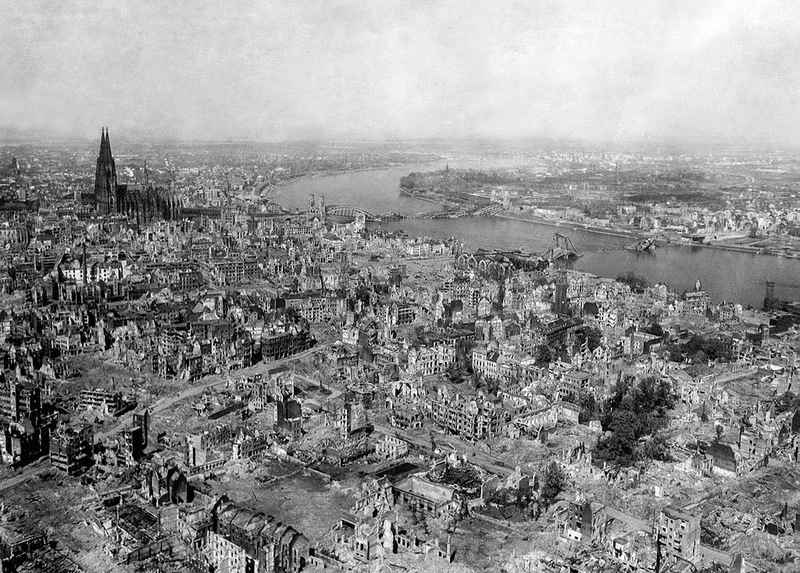 I learned about the heavy bombing of Cologne in WWII. Many postcards in the tourist shops depicted photos such as these. The city center has a large pedestrian-only area (which we always appreciate) and the architecture is "modern," as most of the city was rebuilt after the war. 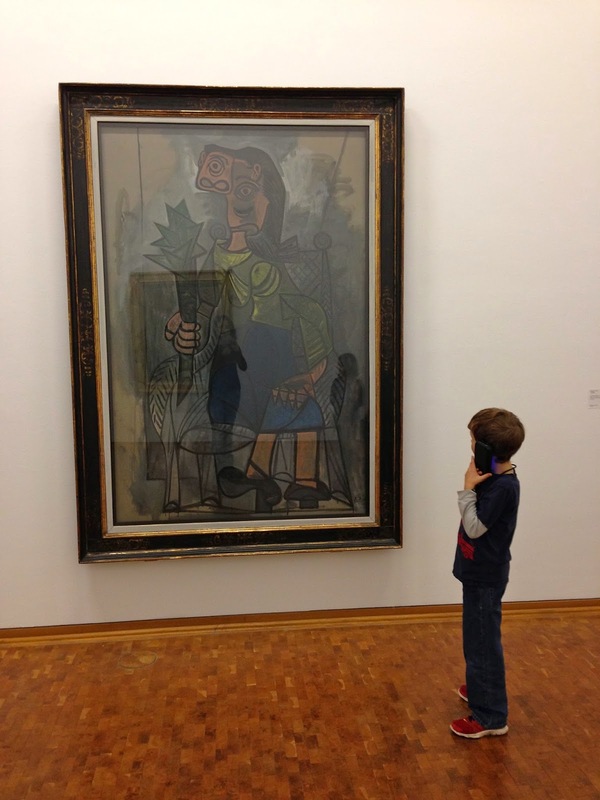 There were quite a few Picassos. James likes audio guides more than the rest of us. We also saw a very disturbing exhibit with videos of pianos being violently destroyed. Here's one being beaten and one falling off a building. Ah, art. 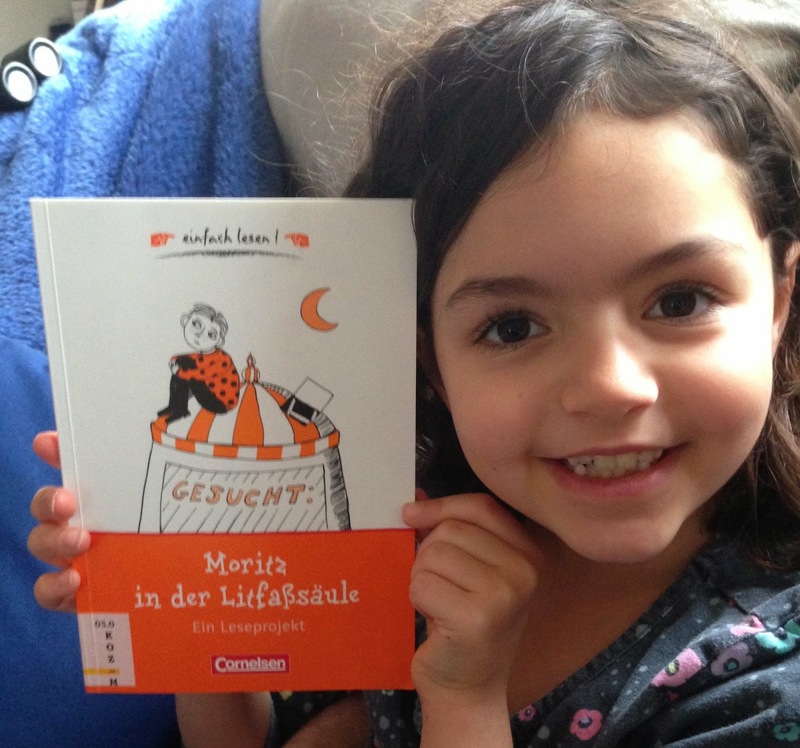 On a lighter note, Daphne's been reading a book in school called "Moritz in der Litfaßsäule." 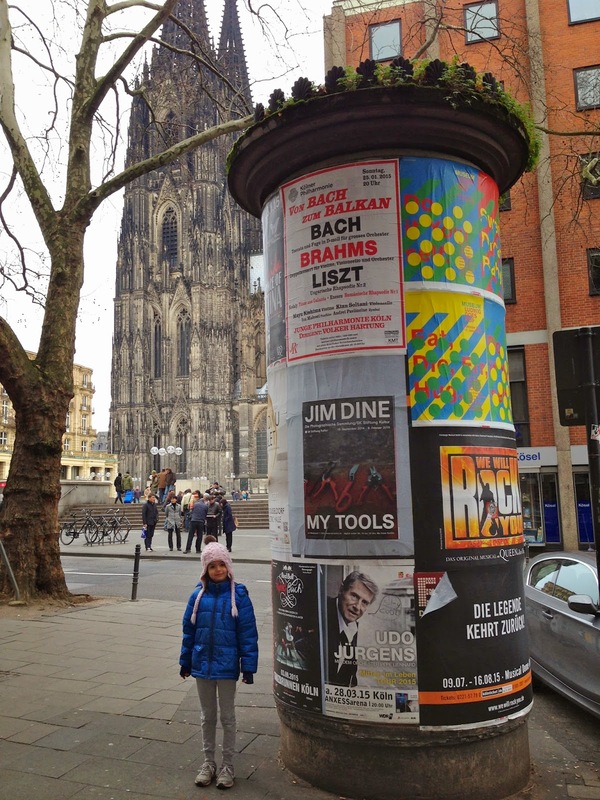 A Litfaßsäule, we learned, is a type of advertising pillar covered with event posters that was invented in Germany. In the book, Moritz runs away from home, taking up residence inside one of these hollow structures. Daphne was soon spotting Litfaßsäule-s (Litfaßsäulen??) all around the city. 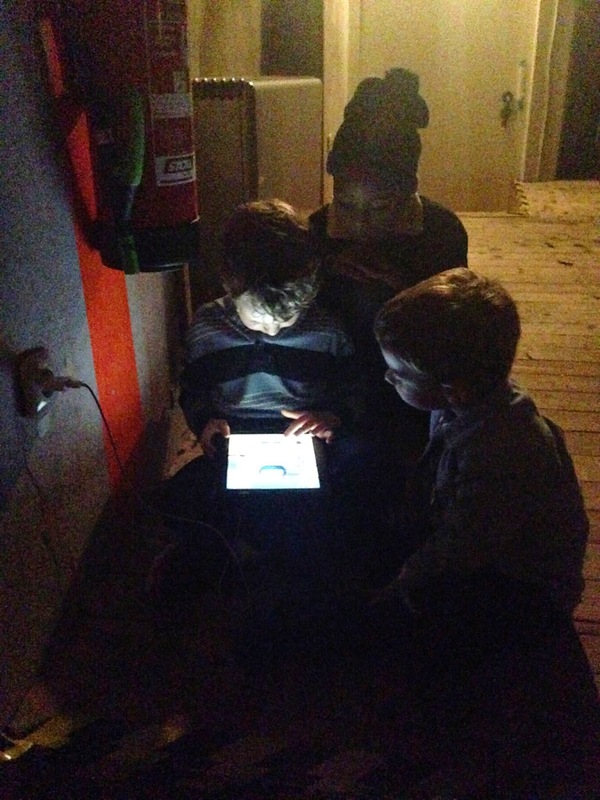 We took photos and sent them to the teacher. A family of teacher's pets, I'm tellin' ya! Another highlight from the trip was tracking down some pretty darn good burritos. 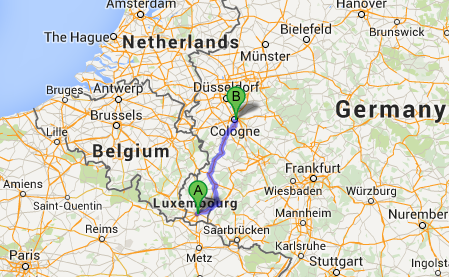 So far Germany gets the best score for burritos in our travels to our neighboring countries. And the last place we went before heading back to Luxembourg was the fragrance museum. 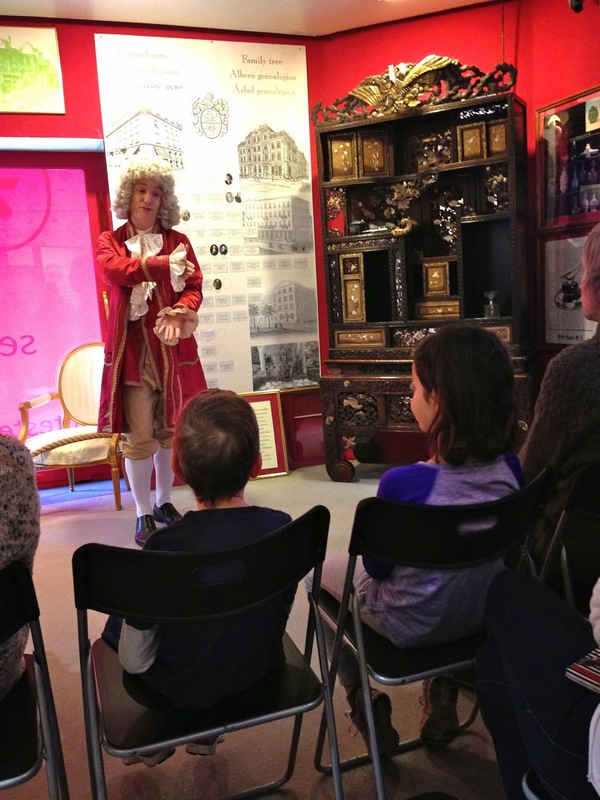 The museum is actually a guided tour of the original shop and factory site, given by an actor dressed up as the 18th century perfume maker, who was originally from Italy but settled in Cologne. Our tour was in English, very interactive, and definitely worth the 10€ total admission for our family. And they threw in this book. What a steal! It seems like we packed a lot into our one night stay, but really I probably just take too many pictures. 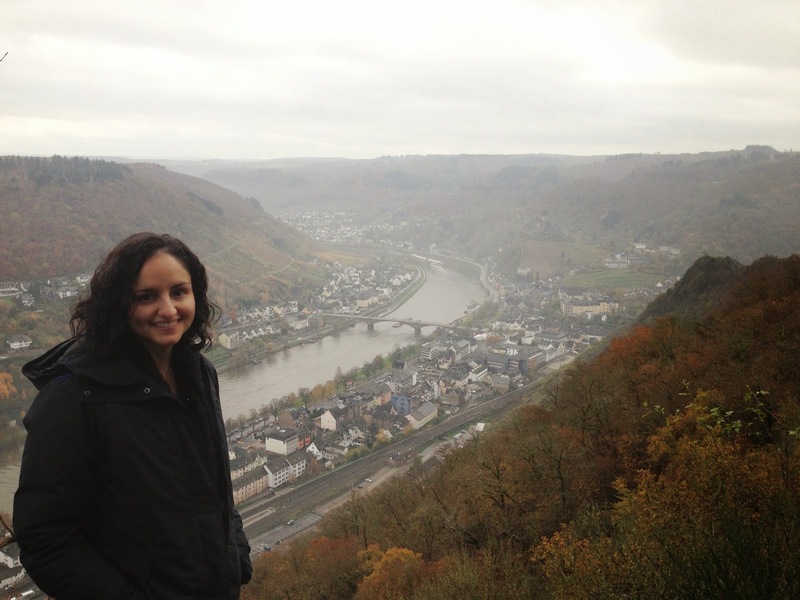 Driving into Cochem on a very misty-gray-brown day. Warning: you're in for a lot of misty-gray-brown photos of a castle. 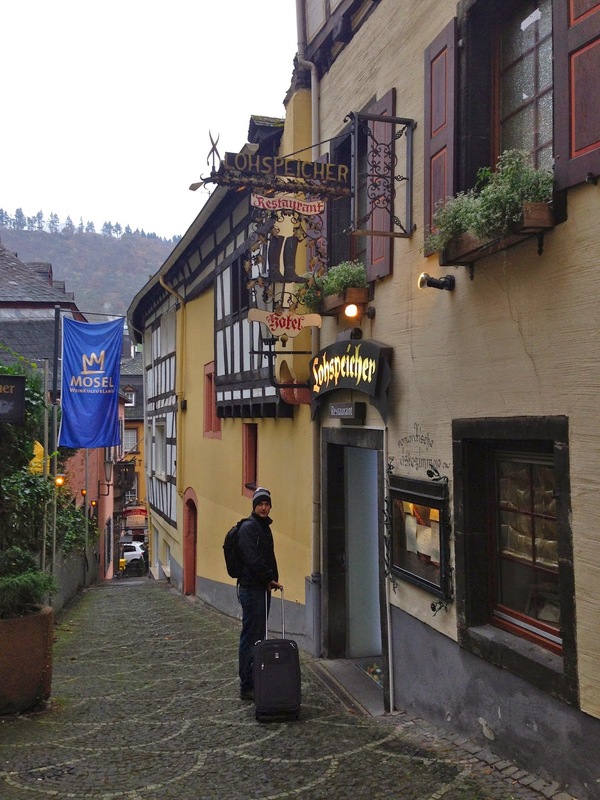 Back in November, when my mom was still in Luxembourg, Pete and I took an overnight trip to Cochem, Germany. 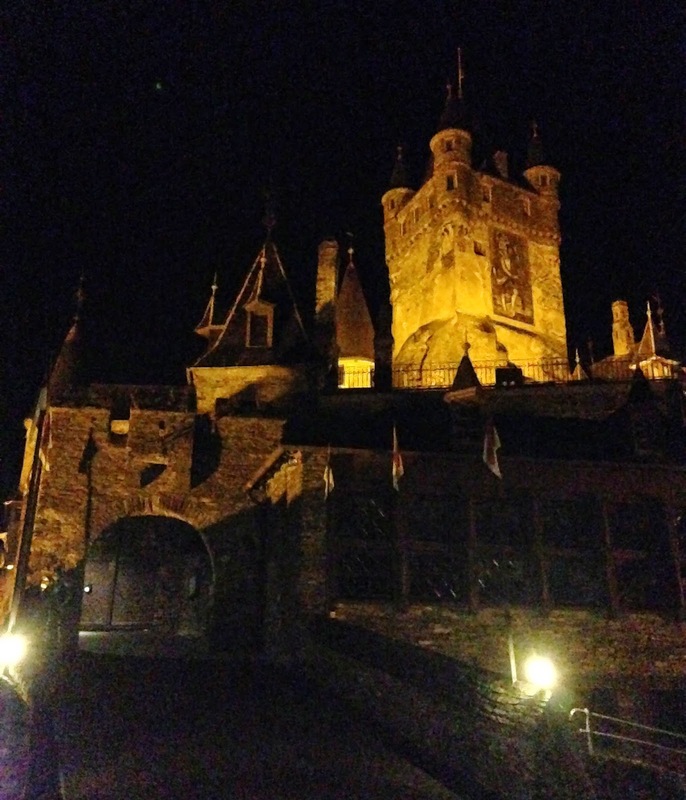 The small town features a castle on a hill overlooking the Moselle river. ...and next to the town square. Note the "Mario mushroom" centerpiece; it comes into play later. 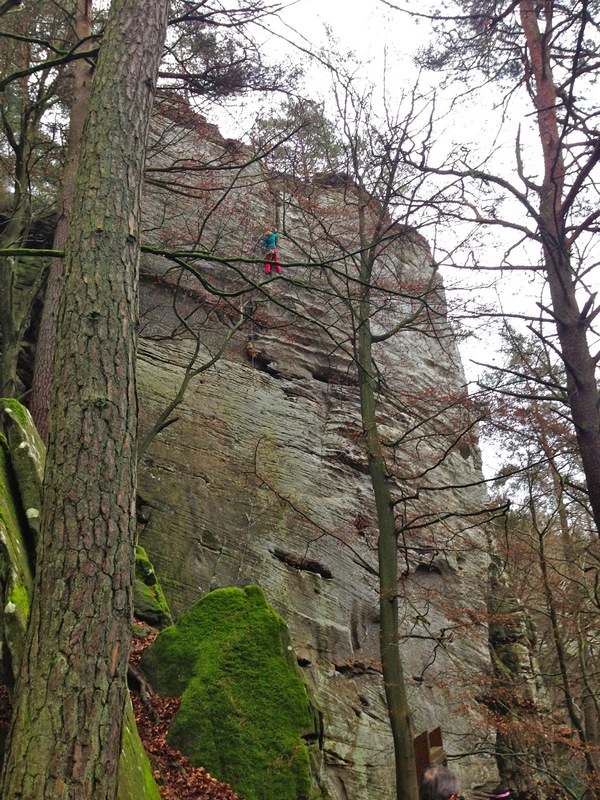 The first order of business was to climb to the castle. We decided to pass on the castle tour (most of them in German and with a wait), because we were still itching to walk around and explore a bit more. We knew there was a chairlift we could take up one of the other nearby hills, affording a view of the castle from yet another angle. Plus, as we looked out from the castle, we saw something interesting. Now what could that be? An abandoned roller coaster? The chairlift takes you to the little white building you can see in the photo above the question marks. So we walked back down and over to the chairlift. We reached the top, and this produced--you guessed it--another misty-gray-brown photo of the same castle. Enjoy. So we walked out to that. There were some drunk people who advised Pete to jump. As we headed back to the chairlift, we noticed a path continuing up the hill, so thought we'd see if we could find that mysterious structure at the top of the hill. 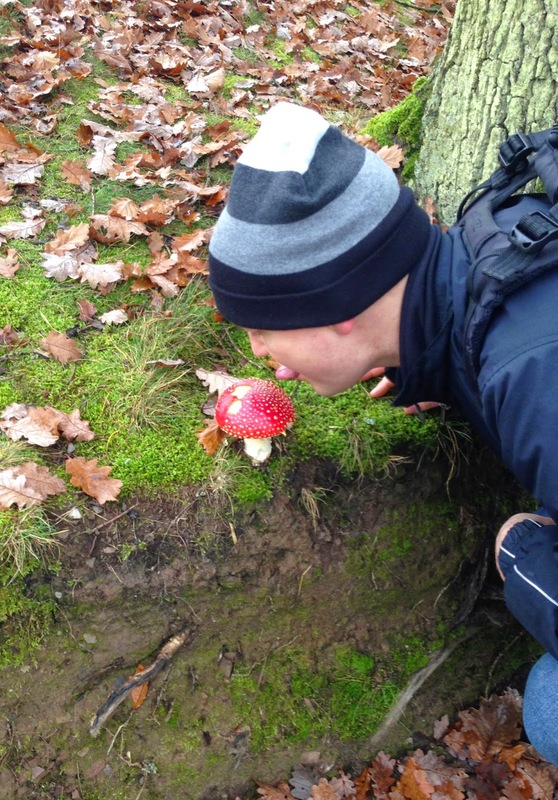 And sure enough, we eventually found it. We continued around the fence to try to find the entrance. And sure enough, we found it. Wild and Free Park! Note the Mario mushroom diaper on the bear. Closed cafe inside. But what exactly is it? It's a wildlife and amusement combo park! Still totally in business, not permanently abandoned, just closed for the off season. I looked it up later on Tripadvisor - it could be fun to take the kids sometime when it's not all creepy and closed. And look what else we found nearby! And then we went back down and had a nice (and cheap!) Italian dinner. you sometimes forget how expensive Lux is! Ohhhh!!! You wanted to hear about the GHOST!! 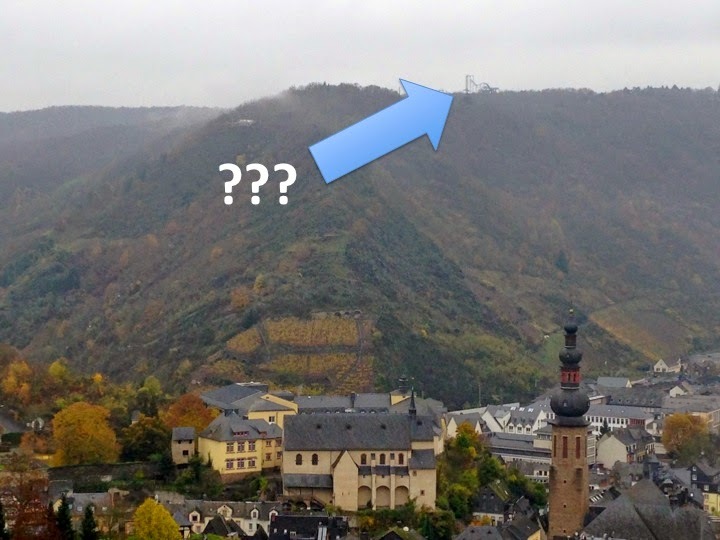 The Ghost of Cochem Castle! Okay, okay. The hotel staff had recommend a wine festival in town as something to do that evening. We went down and checked it out, but decided it wasn't really our scene, and that we wanted to walk around more instead. We opted to make our way back up to the castle to take in the night view. We arrived to find no one at the top besides us, and one empty car parked near the entrance, well past the empty parking lot below. We looked down at the town again, the loud, drunken strains of German folk songs wafting up to us from the wine festival tent (reaffirming our decision to pass on that, thank you very much). As Pete looked over the castle wall and down the hill, I ventured up closer to the castle doors. here, you can see the closed castle doors through the archway. It was then I began to notice a creaking, rattling metal sort of sound. At first, I thought it must be coming from a house below us on the hillside. But as it continued, I thought it might actually be coming from the castle. Still, there was almost no wind at the time; nothing strong enough to blow around anything made of metal. So I walked a bit closer to investigate. As I approached the stone archway, my suspicions were confirmed. The sound was coming from the castle doors. I was starting to get just a tiny bit scared. Now, I don't believe in ghosts. Mostly don't. You see, for most of my life, there've been times when I've woken up in the middle of the night to feel the presence of, and then discover, a dark "figure" in the room, standing there, looking at me. Often, this "figure" could be explained by a lamp or door or plant or some other object that I basically had hallucinated into a more person-ghost-like object. I used to wake up and scream. Then, over the years I learned to tell it to leave. I squint-stare at it and instruct it go away, and after several (long) seconds, it goes (sometimes turns and slowly walks) away. This (mostly) works. So I don't believe in ghosts (mostly). 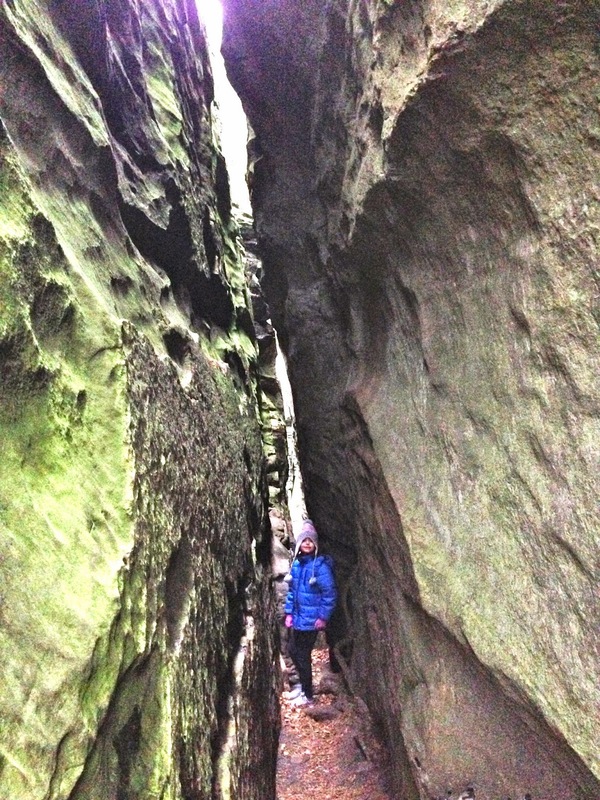 But then, as I looked closer at the castle doors, I noticed a pair of boots through the crack at the bottom. The boots stayed perfectly still, but the creaking, rattling sound continued. Soon, there was a more wooden, shoving sound to accompany the creaking, rattling sound. Someone was clearly trapped inside castle. I ran back down the path to inform Pete: There's a GHOST in the castle and it's trying to GET OUT!! Okay, side note: Have you ever seen the TV show "Castle"? The name is just a coincidence here. Anyway, it's about a homicide detective, Kate Beckett, and a mystery novelist, Richard Castle, who team up to solve murders. Castle jumps at any chance to concoct supernatural theories to explain the murders--ghosts, witchcraft, time travel--and Beckett always brings him back to reality with perfectly logical explanations. Well, picture me as Castle and Pete as Beckett at this point. But with no murder. Yet. And Beckett's usually right. Usually. We both slowly approached the castle again, and Pete saw the feet. The shoving sounds were growing more forceful. Shove...shove...SHOVE.... It was around this point that Pete suggested we leave. And then suddenly, the doors burst open. And a very large, very drunk man stumbled through the opening and toward us, vaguely registering our presence as he continued down the path. He reached the castle wall and retched over the side, as we contemplated the fact that this was probably not the first time that has happened in that exact spot over the centuries. We soon put it together that this guy must be a security guard, or at least and employee of the castle, or at least not a ghost (and Beckett's right yet again). Pete again suggested we leave, before we got mixed up with this guy or involved in an angry German conversation we couldn't understand. But I wanted to stay and make sure he didn't get in that car and drive down the hill. So we watched him amble over to a vending machine, purchase a Coke (a minor miracle in his state) and then disappear back into the castle through a side door. Do we stay or do we go? The front doors of the castle were still wide open. But he soon came back out the side doors, walked past the car, and continued down the hill. We took one last look at the open doors, very tempted for a moment to sneak in for a look, but thought better of it, and followed the guy down the hill. See, now the doors are open. You kind of want to go sneak in, don't you? Once satisfied that our ghost was headed home or down to the wine festival on foot, and not planning to get into another car further down the hill, we parted ways. Did he get in trouble when the gates were found open in the morning? Or, maybe it's his job to open for business too. We'll never know, because we followed our good sense and didn't sneak into the castle and get ourselves locked in with the other ghosts for the night. Basically, what it says in the post title. And there was a nice (indoor!) craft time at the party, something we hadn't seen in previous years. James' teacher, not actual Jeter. And we had church. Lots and lots and lots of church. Our church moved from one to two Sunday services in December, so now the band pulls double duty. We also put on our second Christmas Eve service - much easier the second time around since we kind of new what we were doing and had more help. you can't blame the kid, he's at church A LOT. We video-chatted present-opening with family again. 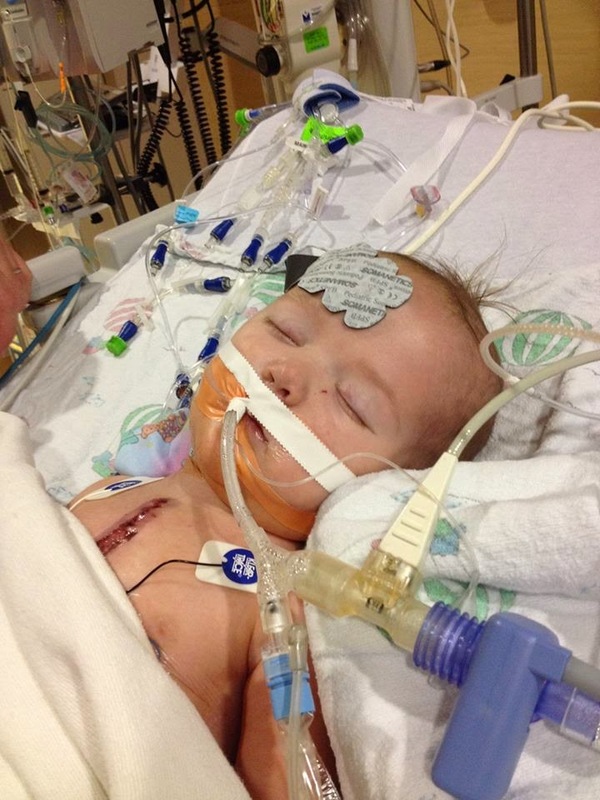 Our little nephew had open-heart surgery to repair several congenital defects, spending Christmas in the hospital. It all went very well, though. 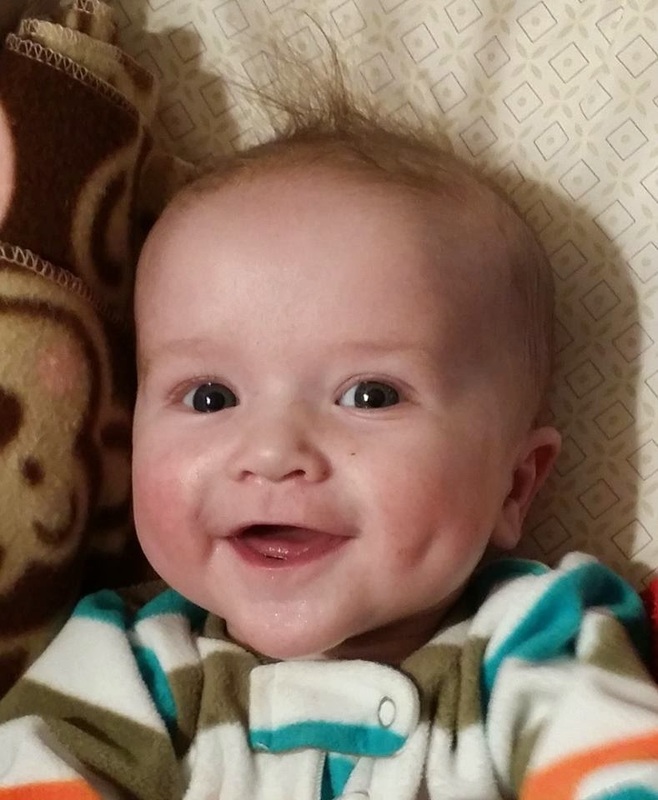 This was his fourth surgery since birth. 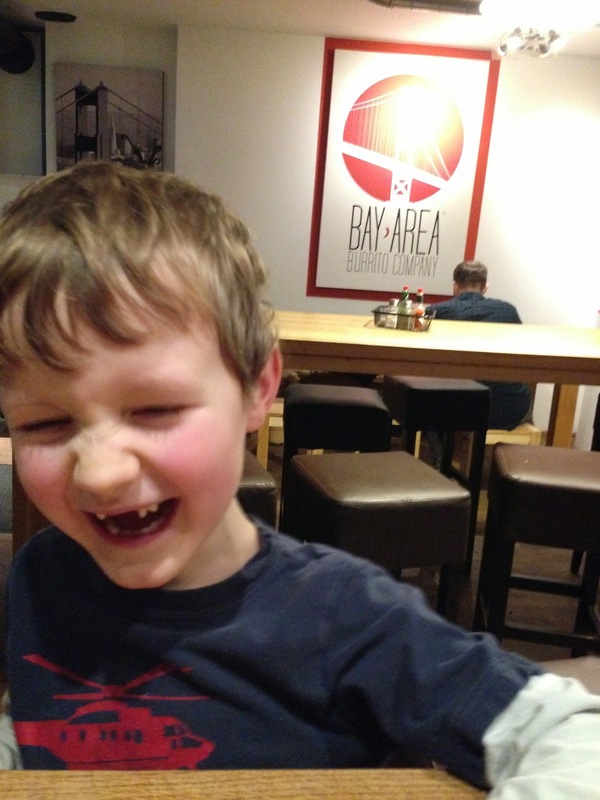 See, he's very happy with his new plumbing! We spent Christmas Day with some Luxembourgish/Belgian friends from church, which included James explaining the rules to one of our favorite board games, King of Tokyo, in Luxembourgish (they speak English too, but it's good practice). And fittingly, we spent Boxing Day with British friends, with a walk in Little Switzerland and a feast of Christmas leftovers. The weekend after Christmas we even had a bit of snow. And then we spent a quiet New Year's Eve at our place with a couple of good friends, playing games and snacking. (Not pictured). And, lastly, Pete and I had our 12th (12th!?!) wedding anniversary on January 3rd. We often forget or almost forget our anniversary, since it comes so quickly after the holidays. But we invented an anniversary tradition this year in hopes that it will help us remember. Last year, some French friends introduced us to the galette de rois at Epiphany (commemorating the arrival of the 3 magi/wise men/kings). So even though it was a couple days before Epiphany (the 6th), we saw the cakes at the shop this weekend and picked one up to eat on our anniversary. 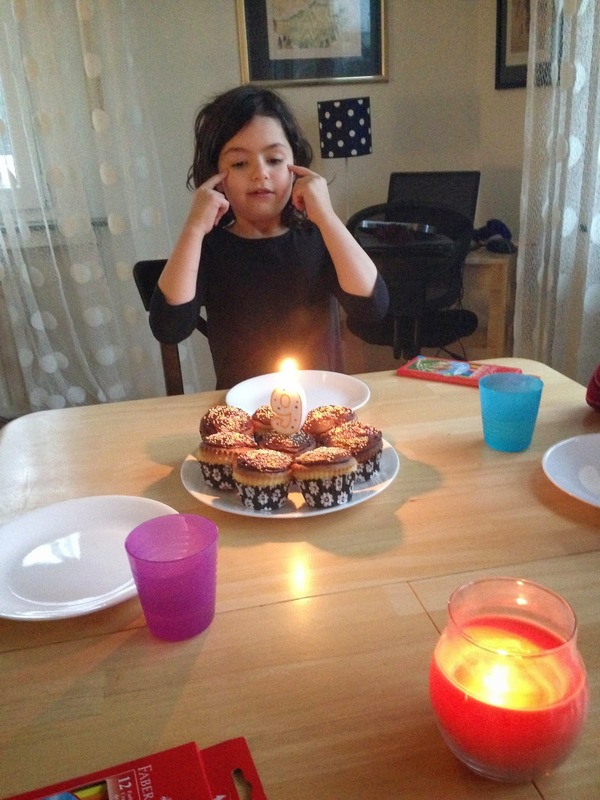 Maybe seeing the cakes in the shops each year will help us remember! Unless we move back to the US! 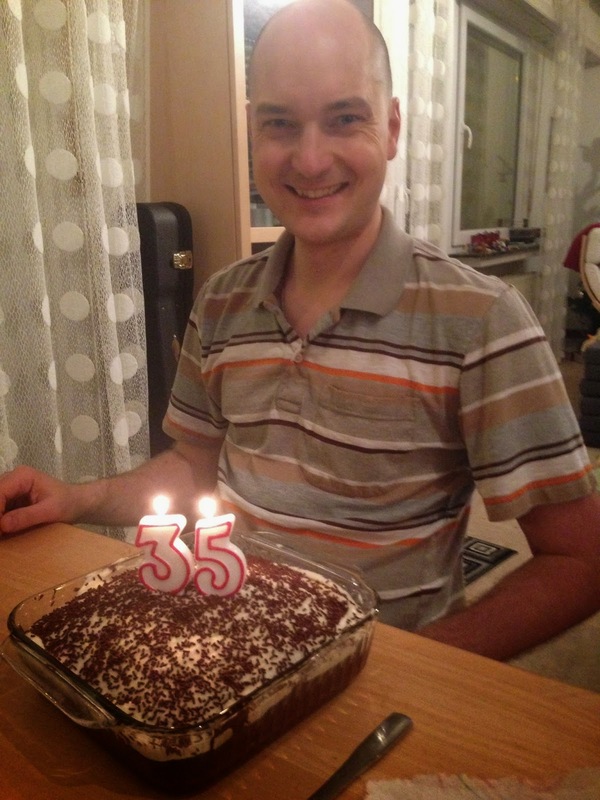 The cake is more like a flaky pastry with a marzipan filling (yum), and with a tiny plastic "gift" baked in. The youngest family member sits under the table as the pieces are doled out, unbiasedly indicating who gets which piece. The person who gets the piece with the gift is crowned king for the year. So there you have it. 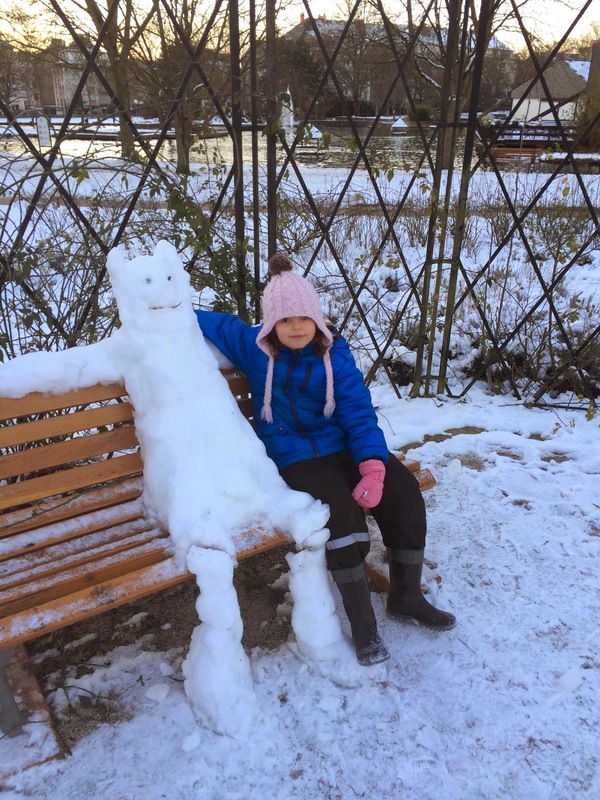 Our third holiday season in Luxembourg is complete. 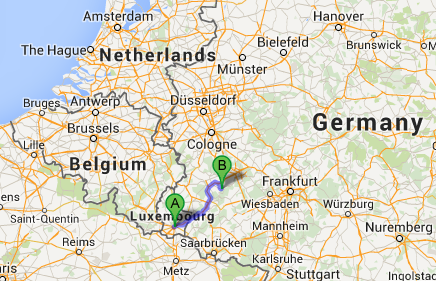 We have now lived in Luxembourg for approximately 2 years and 7 months. 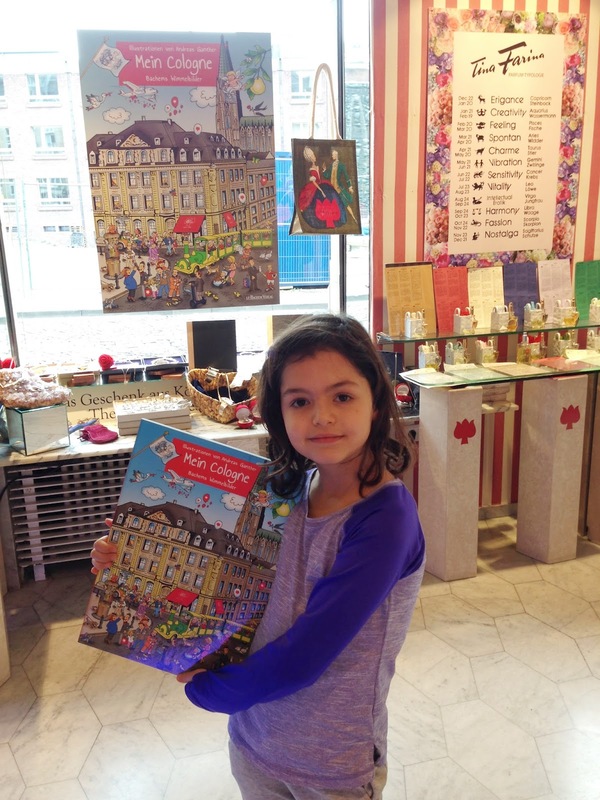 We arrived in mid 2012 and now it's 2015, so we have officially "touched" 4 years in Luxembourg. Happy New Year from the Ts! We're looking forward to all 2015 has in store.